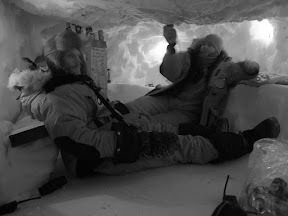 After a lot of digging, Kirsty, Jules and others found The Ice Cave. It's about 4m below the snow, accessed via a tight squeeze and a short ladder. Nice ice Cave - Just right for a cool G&T! There are some pics of mum and dad's trip to London on my facebook. Take a look. Looks like the ice cave has a dress code of manly breads?